Hawaii Native Status: Introduced. 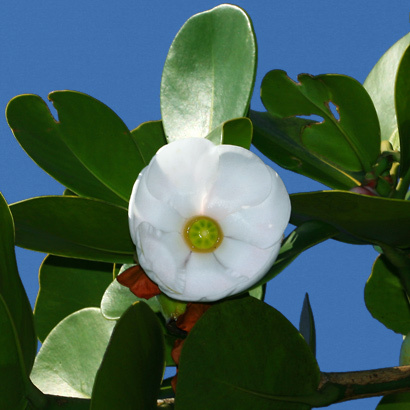 This naturalized landscaping plant is native to Florida and the Caribbean. Description: The flowers are up to 3 inches (8 cm) across and have 6 to 8 broad, rounded petals. The flowers only last for part of the day and eventually turn brown. 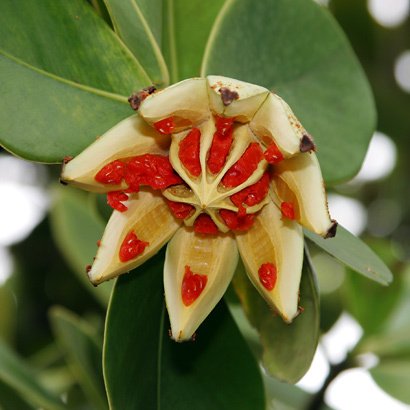 The flowers are followed by green to tan, fleshy, rounded, up to 3 inch (8 cm) in diameter seed capsules. As they dry, the seed capsules split open into thick, flower petal-like segments, exposing the seeds covered with soft, red flesh. The leaves are thick, leathery, dark green, opposite to subopposite, and egg-shaped. This plant is known as Autograph Tree because autographs and other graffiti can be scratched onto the stout, long-lasting leaves. The trees are round-headed, spreading, and have short trunks with smooth bark. These plants often start out as epiphytes. The bird-dispersed seeds will sprout on other plants, send out aerial roots to the ground, and then strangle, smother, and replace the host plant. 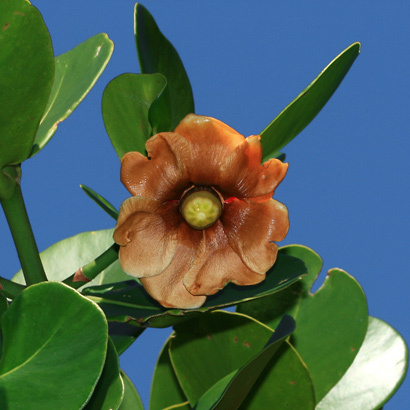 This is the only Clusia species found here in Hawaii. The leaves and flowers somewhat resemble those of a Southern Magnolia, but Autograph Tree is not related to magnolias. Here in Hawaii, Autograph Tree grows in dry to moist coastal areas and other lowland areas below 3000 feet (914 m) in elevation. These plants are quite salt tolerant and so can grow right along the coast. 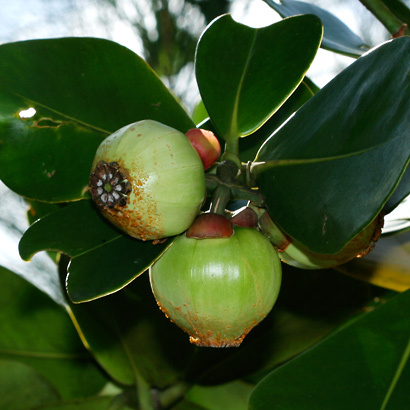 Poisonous – The green fruits are poisonous, but the fleshy seeds are eaten by birds. The sap causes vomiting.